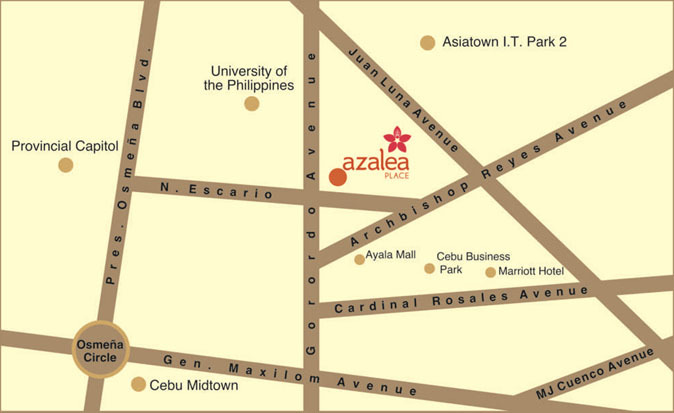 As the first residential condominium to rise along Gorordo Avenue in Lahug, of the Cebu City's most prime location, Azalea Place is a stone's throw away from everything you need. Just across University of the Philippines - Visayas Campus, and well-situated between Asiatown I.T. Park and Cebu Business Park, this Modern Asian-inspired 25 storey tower makes an ideal home for students and professionals who work in the area. Shopping mall and restaurants are also nearby, as are schools, hospitals and government institutions. It is also accessible via all major modes of transportation, making Azalea Place the smart and practical choice for those who value the live-work-play lifestyle.